Any writer of detective fiction faces the problem of creating a point of difference in a crowded genre. For the late Stieg Larsson, journalist and anti-fascist, it was Lisbeth Salander. The first novel in his Millennium Trilogy, The Girl with the Dragon Tattoo, is a flabby and clumsily constructed example of the genre that offers little in the way of original style. (Why it is that characters in crime thrillers invariably 'punch' numbers into mobile phones these days I have no idea.) It's Lisbeth Salander that keeps you reading. A film adaptation has to get the character right. 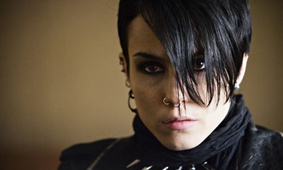 And Noomi Rapace gets Salander. She plays her pretty well straight-up Asperger's, unamused, dodging eye contact, obsessively seeking patterns in raw data. More than that, we catch in Rapace’s darting eyes her confusion in relating to other human beings, we see her working things out in her head, deciding how she should respond. Most compelling of all, Salander's dissociation, as presented by Rapace, borders on psychosis. Her capacity for violence is more, surely, than a passion for justice. That she turns out on the side of good rather than bad is a matter of chance. Apart from that, The Girl with the Dragon Tattoo carries over some of the flaws of the book, though to a lesser degree. Salander's co-protagonist, the left-wing investigative journalist Mikael Blomqvist (Michael Nykvist) is less heroic and more convincing. The plotting is tighter, thanks to the adaptation process, but the awkward structure, which frames one substantial plot inside another, remains and makes the film far too long at more than two-and-a-half hours. The screen version also highlights another hero - the Apple Mac. The key to the central mystery Blomqvist and Salander must unravel, the disappearance of the daughter of a Swedish industrialist in 1966, is contained in old photographs and the enhancements made possible by computer technology. There are moments when we could be watching Antonioni’s Blow Up (which I notice happened in 1966 too), straining to extract meaning from blurred, grainy images. Quite how detectives used to manage to crack cases without laptops becomes the real mystery.